An instant landmark when it appeared in 1993 and a record that I hope is passed down through the ages in the same way that Violent Femmes debut has been, Exile in Guyville still sounds as amazing as ever. Of course, “amazing” is a relative term for an album that helped define what we all called “lo-fi” back then: records that sounded unfinished and unpolished, with all of jagged edges sticking out for unsuspecting folks to scrape themselves against. Exile in Guyville was all of that and more, of course. Swirling around its vortex was a unique blend of sexual politics, D.I.Y. swagger and some of the most sharply-observed lyrics anyone had ever heard. And in the middle of that vortex was Phair herself, projecting complete fearlessness and confidence no matter how confessional her songs got. But listen to her voice, or should I say voices, as she continues the Girlysound trick of multi-tracking her vocals, as she goes flat on “bet” and “enough” — which is definitely a choice, and an major signifier of indie authenticity — and turns that flatness into hooks. 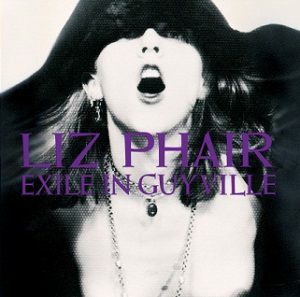 Of course Exile in Guyville has always been hyped as a song-by-song response to Exile on Main St., which I’ve never fully gotten, as if she needed any reason other than being clever and cheeky to title an album Exile in Guyville. In any event, “6’1″” got Exile in Guyville off to a rip-roaring start in much the same way that — to pick a completely random and unrelated example — “Rocks Off” kicked off Exile on Main St.: both setting the scene and getting you excited for what was going to come next. For reasons, I guess, most of Exile in Guyville isn’t on YouTube, so here’s a Spotify link.